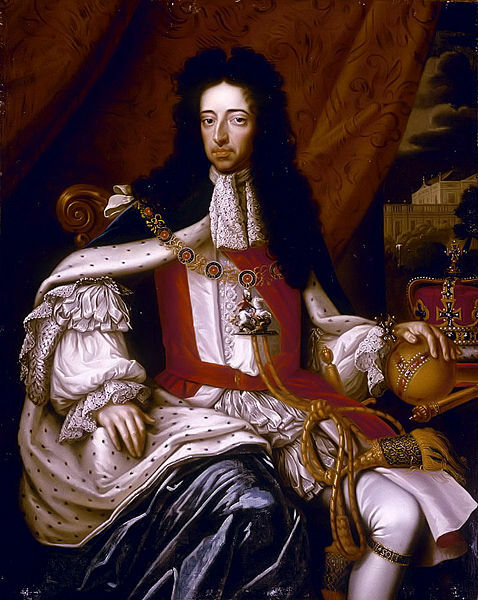 in which the Protestant William III defeated the Catholic King James II, took place on July 12, 1690. Today is its 323rd anniversary. In Northern Ireland and other parts of the UK, members of the Orange Order make the most of the event by hosting parades and other celebrations. The result is often, sadly, confrontation with their Catholic neighbors! The main characters in the historical conflict are all too often vilified or canonized based on who’s telling the tale. But there are many subtle complexities and paradoxes surrounding the battle that are often left unmentioned in the interest of building sectarian hatred, and balance in depicting the royal rivals is often sorely needed. King James II of was a Catholic in name and practice, and refused to compromise his religious convictions for political gain. He was an honest man by nature and always assumed that others would be equally frank with him. But he was also politically clumsy and provocative in his methods of suspending laws in order to grant Catholics and Dissenters freedom of worship. He also put too much faith in his own position as King by divine right, assuming this same supposed invincibility would be passed onto to his heirs by the same token. But the Protestant members of Parliament had no intention of allowing James’ newborn Catholic son to inherit the throne and continue his father’s work, so they secretly opened communications with his son-in-law, William of Orange, inviting him to come over to England and overthrow James. With defection rampant amongst the King’s ranks, including the self-centered General John Churchill, future Duke of Marlborough, William and his Anglo-Dutch army marched on London and set into motion what was to become known (although not universally accepted) as “The Glorious Revolution”. King James, suffering from severe nose-bleeds and stunned silly by the betrayal of his own family and high-ranking officers, hesitated in his response until there was nothing left for him to do but flee the country along with his wife and infant son. In 1689 Parliament triumphantly declared that Prince William of Orange and his wife, James’ eldest daughter Princess Mary Stuart, would rule over the kingdom as joint sovereigns, providing they agreed to sign a Bill of Rights guaranteeing the powers of Parliament and some basic personal rights of their subjects. These, unfortunately, did not extend to Catholics, but rather hampered the Recusants further. Still they were an important step forward in the history of democracy and the beginning of religious toleration for some if not all. William of Orange was personally frail, feeble, and slender in frame, with a beakish nose and bright, keen eyes. He suffered from severe asthma throughout his life, making the rigors of campaigning difficult for him. Still, he never complained and insisted on leading from the front. He was noted for being gruff and withdrawn, granting favors only reluctantly and denying them rudely. But he could also be generous to the tenants on his royal estates and offered assistance to thousands of Protestant refugees fleeing religious persecution throughout Europe. He was a strict Calvinist, but was not eager to persecute others because of their religious differences. However, his actions in favor of the Reformed Faith in the British Isles and Ireland in particular have forever associated with militant Protestantism. Ironically, the Catholic Hapsburgs of Spain supported his military endeavors, for William was a fierce opponent of King Louis XVI of France and had decided to act in British Isles mainly because he wanted England to join him in the Alliance against French aggression in Europe. The Spanish ambassadors at The Hague even had masses said for William’s successful voyage to England, in spite of the fact that wind which brought his ships over has gone down in history as “The Protestant Wind” (and may in fact have been dubbed with equal accuracy “The Catholic Wind”)! Even the Pope backed William when push came to shove because of his opposition towards France, ordering the bells in Rome to be rung in celebration of William’s victory at the Boyne, even though the Penal Laws against British and Irish Catholics were forthcoming. The pontiff also refused to consider King James for canonization after his death, ignoring the reports from several Irish Jesuits that miracles had taken place at his tomb. In 1689 the undeterred King James made a last-ditch attempt to regain territory for himself in parts of Ireland, gathering a Catholic Irish army under the competent Richard Talbot, Earl of Tyrconnell. Determined to strike back at the Protestant infringement on their rights, they besieged the city of Londonderry in Ulster. The Protestant defenders resolutely refused to surrender until they were reduced to starvation, and just in the nick of time, William and his army rode to their rescue and relieved the city, making himself the ultimate hero in the folk imagination of the Ulster Plantation Protestants and creating the legend that would one day give a name to the Orange Order. After liberating Londonderry, William and his troops rode south towards Dublin, roughing it as they went, sleeping on beds of hay in draughty barns. Naturally none of this helped William’s asthma, and the dust kicked up from the horses was enough to send him into wheezing and sneezing fits. But all was not unpleasant. It was noted that during the march south he and his men made camp in an orchard and feasted on the abundance of cherries in the vicinity, brightening even William’s dour mood and making him more affable with his men. When the two opposing armies finally came together at the Boyne River, King William led from the front, as always. King James, on the other hand, lagged in the background. Apparently age and repeated disappointments had taken its toll on the once charismatic naval hero, and he now preferred to watch from a safer place. One of James’s snipers managed to set his sights on William just prior to the battle and shot him from his horse. William’s troops were terrified by the prospect that their leader had been killed, but William just got to his feet and demonstrated that it was only a shoulder wound. He was bandaged accordingly and helped back onto his horse. Still remaining in the front, William was cheered on by his soldiers. In the end, the Dutch prince carried the day and James was forced to seek refuge in France again, this time permanently. For the Catholic Irish this was a total disaster, brought about mainly because the English James – whom they had fixed their hopes on – refused to listen to the advice of the Irish General Patrick Sarsfield and then blamed the debacle on lack of discipline in the Irish ranks. William was not a persecutor by nature, but he knew full well that the Protestants in Ireland and England were thirsting for revenge. Rather than upset them, he played devious dealings with the Irish, signing the Treaty of Limerick (which promised the Catholics free practice of their religion) whilst knowing full well it would never be approved by Parliament. Instead of a relief bill, the Penal Laws were enacted, making the lot of Catholics more difficult than ever before. As for the soldiers of James, they were classified as rebels and traitors under the law. But William was also mindful that he was allied with Catholic powers in his fight against France and didn’t want to upset them. He even carried a letter from the Pope on his person during the Battle of the Boyne. Hence, he agreed to allow the Irish soldiers of James’s army to peacefully leave the country in a massive exodus known to history as “The Flight of the Wild Geese.” Many of these soldiers went on to form Irish brigades in the armies of Catholic European powers, some of which fought against England in future wars. William also offered the Irish soldiers the opportunity to join his own army, which had a fair number of Catholics in it already, lent to him by Catholic allied countries. King William’s demise had a darkly humorous twist similar to the old parable of a soldier who returns from battle only to slip on a bar on a bar of soap in the shower! On a day when his barometer told him he could finally emerge outside without fearing an asthmatic reaction, the King decided to go hunting in Richmond Park, taking time to admire his flower gardens along the way. His horse stumbled over a mole hill, throwing the royal rider to the ground. William’s collarbone was broken and soon fever set in. He died two days later in Kensington Palace on March 8, 1702. A locket with the lock of his wife’s hair was found around his neck. Unsympathetic dinner table Jacobites took up the toast: “To the little gentleman in black velvet”, in honor of the mole who dug the infamous hole. They were also quick to spread the rumour that the horse from which William had tumbled had once belonged to a Jacobite nobleman, Sir John Fenwick, who had been executed after being implicated in an assassination plot against the King. While many people had disliked William’s cold, aloof, and taciturn approach to life, he made an interesting comparison to his arch-enemy, King Louis XIV of France. It was said that while Louis made war with great splendor and panache in the style of a true king, William made war like a true soldier: simple, straightforward, and with steely determination. He may not have been a brilliant general and never rivaled the glory of “The Sun King”, but he was a great leader whose courage inspired the best in his men and whose dedication to his beloved homeland, the Netherlands, made him willing to make any personal sacrifice to put a halt to Louis’s land-grabbing. His personality type and fighting style were similar to his stiff yet effective ancestor, William the Silent, who led the Dutch in rebellion against their Spanish overlords. He can also be closely compared with the Duke of Wellington, whose greatness was found in quiet strength, dogged pursuit, and a refusal to submit to tyrants. On both sides of the Atlantic, no matter what our religion may be, we are all heirs to the legacy of “The Glorious Revolution” and the emphasis that it put on the rule of Parliament over the rule of the Monarchy. In fact, Michael Barone in his book Our First Revolution makes a sound case for his belief that the American Revolution was built on the foundation that was laid in "The Glorious Revolution". So just as Catholics should remember to appreciate the good aspects of King William and his bid for the throne, so should Protestants recognize the global Catholics that helped put him there. The ability of Catholic mercenaries and the power of the Holy Sacrifice of the Mass should never be underestimated. Please keep the people in the UK, especially the more heated sections of Northern Ireland, in your prayers. This is “marching season”, and tempers tend to flare on both sides, so lets pray everyone will keep they’re heads and stay safe.